Jared Unzipped: Where Did Christmas In July Come From? Now that the Fourth of July is behind us, we're entering into the Holiday Wasteland. No major holidays are on the American calendar between now and September. Yet, I'm reminded of ironic Christmas in July shopping events. When I was young, my mother used to watch all of the various Christmas in July sales and promotions on the QVC home shopping network. That's right... I'm parlaying an article out of a memory concerning QVC. Just bear with me, folks. What's stayed with me for all of these years is how blatantly profit-driven those televised sales were. Snowglobes and reindeer... for sale in July? Oh yes... and even more. You could get everything holiday related that you'd normally see for sale in December, but during the middle of Summer. In fact, QVC is still holding their annual Christmas in July sale more than twenty plus years since I can recall first seeing it. So where did the concept of a Christmas in July originate? The idea is more simple than you might think. In the Southern Hemisphere of our planet, the seasons are reversed from those in the Northern Hemisphere. Instead of experiencing Winter in December, January and February, countries like Argentina and South Africa endure their coldest months in June, July and August. Likewise, December, January and February in the Southern Hemisphere are Summer. To experience and celebrate the more recognizable Northern Hemisphere Christmas, many countries south of the Equator hold Christmas in July events. 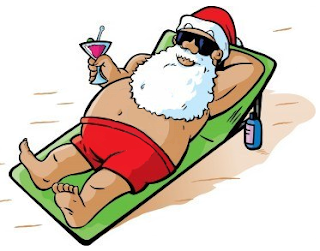 You could see Santa Claus sipping a margarita on the beach, or a snowman made out of sand (sandman?). Gifts may or may not be exchanged. The Southern Hemisphere still celebrates Christmas in December, so they practically enjoy the holiday season twice in one year! Of course, leave it to capitalists to take a wholly innocent idea and run with it. Adopting the Christmas in July theme, retailers began using it as a promotional tool to move merchandise during the slowest sales time of year. This practice goes as far back as the 1950's in the United States. So there you have it -- Christmas in July actually does have a reason to exist. If you're in Australia, then Christmas in July is about festively sharing a sense of merriment and wonder with your fellow man. If you're in the United States, then Christmas in July is an excuse to purchase sports bras, running shoes and video games at forty percent off! Just in case you were wondering, Australia does see snow in June. Here's an article with photos detailing a terrible snow storm they received just a month ago.